Pickle juice-brined pork chops. Yes, you read that correctly. We know. Why didn’t we think of brining pork chops in dill pickle juice? It’s easy, ingenious, delicious. 1. Place the pork chops in shallow dish and pour the pickle juice over. Cover and marinate in the refrigerator, turning occasionally, for at least 3 hours and up to overnight. 2. Preheat the oven to 350°F (175°C). 3. Drain off and discard the brine. Pat the pork chops dry and season with salt and pepper. 4. In a large cast-iron skillet set over medium-high heat, warm the oil until shimmering but not smoking. If using the dill sprigs, press half onto 1 side of the pork chops. Place the pork chops, dill-side down, in the skillet and cook until browned and crisp on that first side, about 3 minutes. Press the rest of the dill on the top side of the pork chops and flip. Immediately transfer the skillet to the oven. 5. Roast the pork chops for about 10 minutes, until the meat springs back when you give it a forceful poke with your finger, 145°F (60°C) on an instant-read thermometer inserted into the thickest portion. The timing will vary somewhat depending on the thickness of your chops. 6. Let the pork chops rest for 5 minutes before digging in. 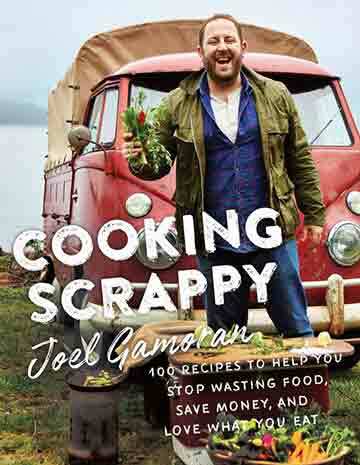 Pickle Juice-Brined Pork Chops Recipe © 2018 Joel Gamoran. Photo © 2018 Jim Henkens. All rights reserved. All recipes and photos used with permission of the publisher. This was certainly an interesting new way to brine pork chops! It does create a juicy, flavorful chop, but you’d better like the taste of dill pickles, as the chops were infused with the tangy taste of pickles. I used the juice from Kosher Dill Stackers, but next time I’ll try the milder Bread and Butter pickle juice to get the juicy tenderizing effect but not so much of the pronounced tart pickle flavor. Since there are only the two of us in my household, I purchased two 1 1/4-inch thick bone-in pork chops and marinated them for 4 hours in the fridge. It only took 2 1/2 minutes of searing to get the chops browned, and it took 20 minutes in the oven, since they were so thick, to get them to an internal temp of 145°F. I inserted an oven probe thermometer into the side of one of the chops to monitor the temp, so I wasn’t opening up the oven door repeatedly to test their temperature. Some of the dill sprigs turned brown, but some stayed nice and bright coming out of the oven, but we couldn’t discern any noticeable dill flavor from them as the pickle flavor was so pronounced in each bite of the chop. I served these pork chops with roasted sweet potato spears and steamed broccoli. 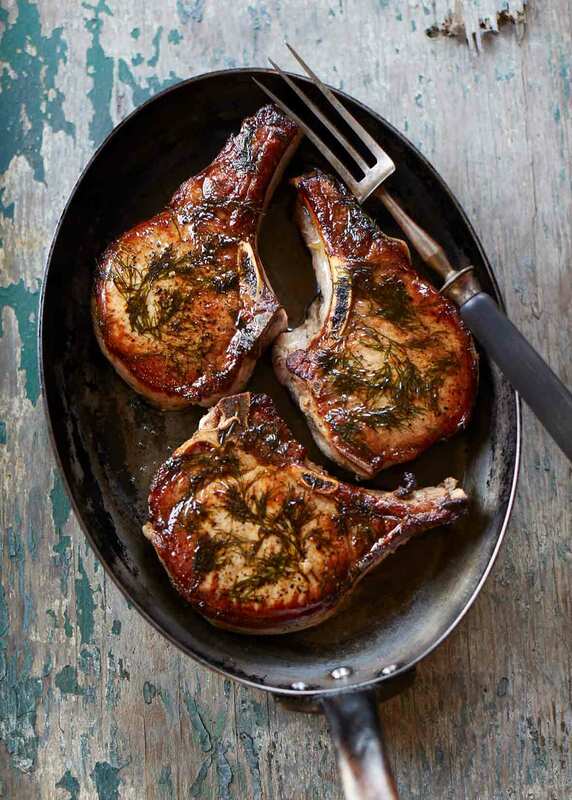 This recipe will get you out of your “pork chop night” rut! Such a different, intriguing way to shake up your standard pork chops. The chops were perfectly cooked and seasoned. I think this merits a TC because it’s so unique. The copious amount of dill, which worried me at first, was a lovely dark green and delicious. I think it’s worth noting that, if you pick up the .75 oz packets of fresh dill in the produce section, you’ll need to purchase 2 for this recipe. I let the meat rest a good 15 minutes before we dug in. This recipe for pickle juice-brined pork chops makes the brining process super easy. The chops were perfectly browned and moist and had great flavor from the fresh dill sprigs that turned a darker shade of green and got fairly crisp. This is a great dish to prepare during the week since the pork chops can be brined overnight or in the morning and be ready to cook that evening. The only issue will be what to do with the pickles after the juice has been drained. I decided to re-fill the pickle jar with a mixture of 2/3 water and 1/3 white vinegar. I was a bit skeptical about this recipe but I was pleasantly surprised. I think the brine keeps the chops moist and flavorful. Hands-on time is less than 10 minutes. Everything else is marinating, oven, or rest time. This is really a nice recipe if you have other food to prepare. I had plenty of pickle juice, but now I have a jar of dill pickles with no brine so eat up! When I pressed the dill into the meat, I was not sure what it was going to look like after cooking. I did get a nice crust on the chop after the first 3 minutes but the dill just looked wilted and sad. I was hoping it would get nice and crisp. I soaked the pork chops for 48 hours, as that fit in with our schedule. (it was a busy weekend with babysitting grandchildren included). I used a 10-inch cast iron skillet. The dill sprigs got quite brown, but I may have let the chops brown too long on the stove. They still looked appealing and attractive after the total cooking process. My husband enjoyed these juicy and tender pickle juice-brined pork chops. He did not notice the taste of any pickle juice, just the dill, salt, and pepper and thought that they would be nice in his regular pork chop rotation as a change. My pint sized pickle jar easily yielded 3/4 cup juice but left the pickles a little dry and lonely. The chops did release a lot of brine in the skillet. One of the challenges of the recipe was to put the chops in the pan without the dill falling off. I served the chops with some roasted potatoes, wax beans and salad. If someone wanted to make this recipe a lot I think they would really need to eat quite a few pickles. However, it does provide a nice use for leftover pickle juice. These pickle juice-brined pork chops are a nice change of pace from your standard chops recipe. They were delightfully “dilly” but not in an overpowering way and still moist even though they had cooked longer than planned when I got stuck answering the door. I brined the chops in the dill pickle juice overnight. As pickles can sometimes be on the salty side, I lightly seasoned the chops before adding the dill sprigs and searing them in the pan. Searing took 4 minutes to get them slightly brown and crisp. The dill was quite dark in color but not crisp. The pork chops were delightfully “dilly” but not in an overpowering way and still moist even though they had cooked longer than planned. The dill never got crisp and after trying some we removed it from the chops. I had hoped it would crisp up after the searing and roasting but it remained dark and was a little unappealing. We served these with a garden salad with a dill dressing. It was Dill-ishious! If I try this recipe I plan on altering it by FRYING the pork chops in oil after the brining process is through in a cast iron skillet if I have everything I need. Instead of baking them, I plan on using the cast iron skillet on the stove to fry the pork chops. This brining method is simple and yields a delicious, moist pork chop. I marinated the chops overnight and noticed a little discoloration around the edges of the chops, however, it was not apparent after cooking. The fresh dill coating is a nice addition; it will darken a little with the initial browning process, but still adds an interesting visual component to the chops. I used the juice from bread and butter stackers pickles and it was perfect. As previous comments have indicated, baked sweet potatoes and a seasonal green vegetable are the best accompaniments. This will put pork chops back on the rotation in our house. Donna, so happy to hear that you love this recipe as much as we do! We so appreciate you taking the time to let us know. Wishing you many more happy pickled juice-brined pork chop dinners in your future!